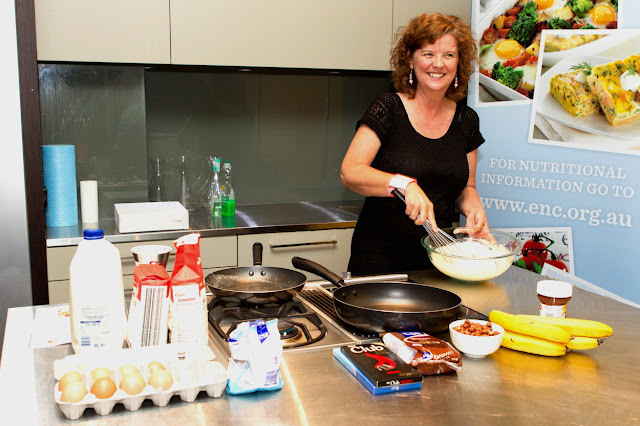 One of the great things about being a blogger is that you meet great people like the lovely Seana Smith from Sydney, Kids, Food and Travel who are good at sharing and dob you in to attend fun events with people like celebrity chef Adrian Richardson. 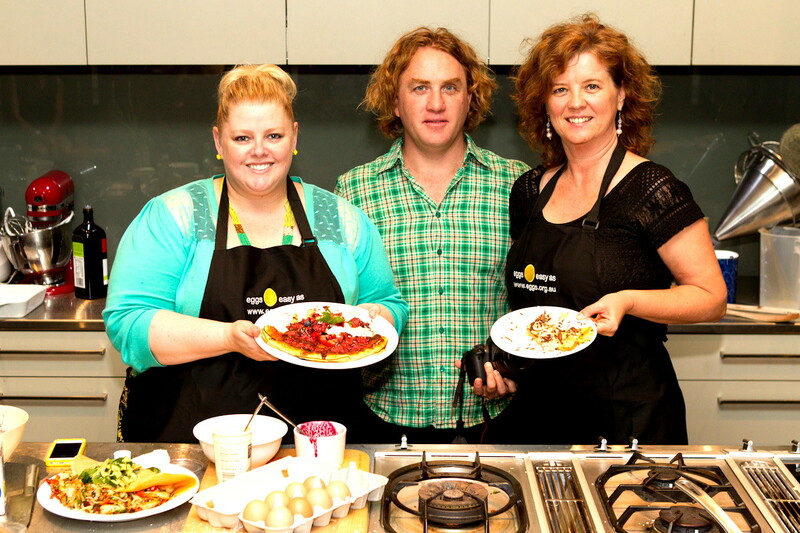 Unfortunately Seana ended up not being able to make it, but the rest of us gathered in Simon Johnson's demonstration kitchen in Alexandria. 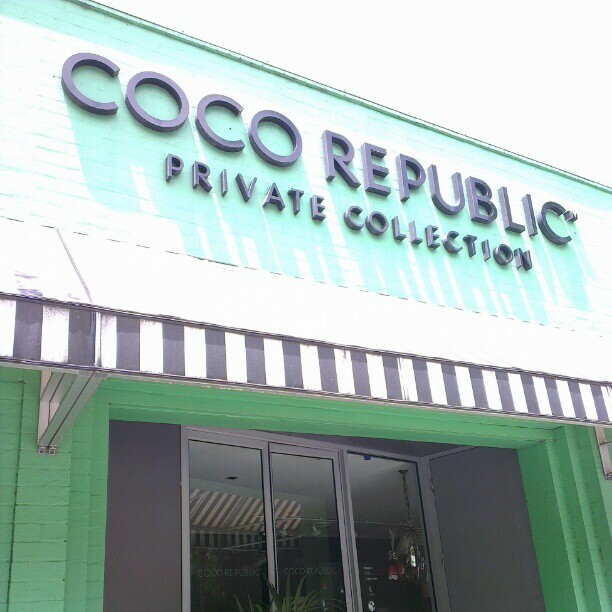 That hive of industrial chicness, which is also home to such beauties as this place, but more on that later. Simon Johnson's is a fantastic gourmet store, which is of huge interest to foodies like me. 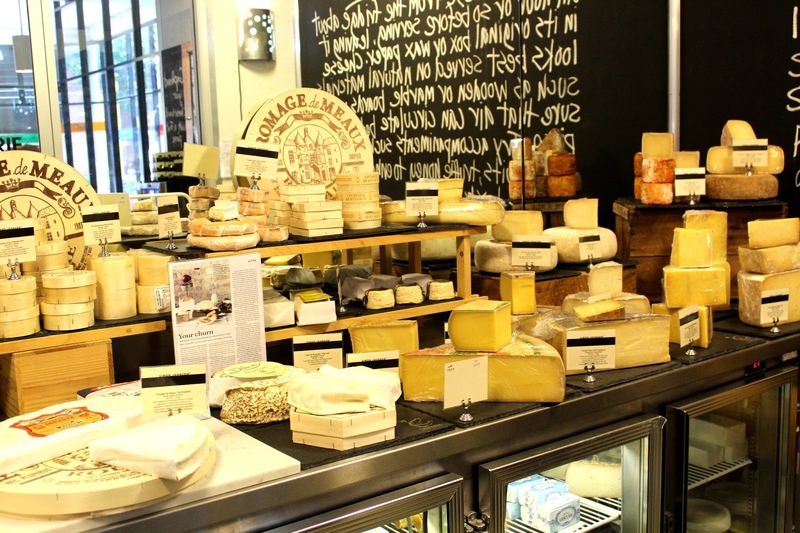 The cheese room was to die for. 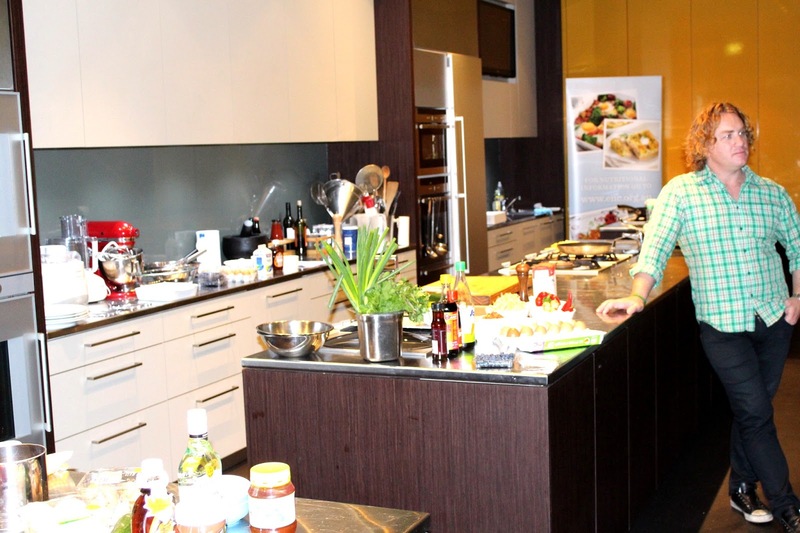 We gathered in the demonstration kitchen upstairs to talk pancakes. Tomorrow is Shrove Tuesday and apparently pancakes are the order of the day. The idea is that you clean out the pantry before Lent begins, which ends with Easter. In doing so, pancakes are a good way to use up all the baking goodies that you will not be using during Lent. Yeah right!!!!! If you are anything like me, which I suspect most of you are, you don't follow these traditions and would eat pancakes every day of the week, if only your hips would let you. The most amiable Adrian agreed with my theory and made two dishes for any time of the year, one savoury and one sweet. 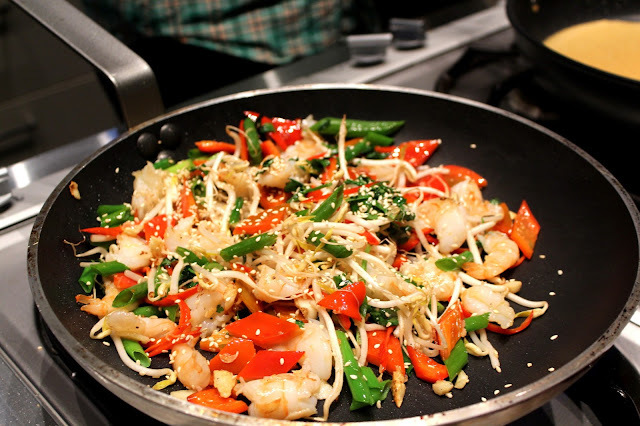 This Thai Style Pancake with prawns, which serves two and was as it looks, incredibly yummy. Then he whipped up a lovely sweet number. It seems the more fat you add, the better it tastes. A fact I should have been more cognisant of it seems. Because unbeknownst to me, there was to be a cook off between fellow blogger, Lisa from Life as We Know It and myself with mystery ingredients. 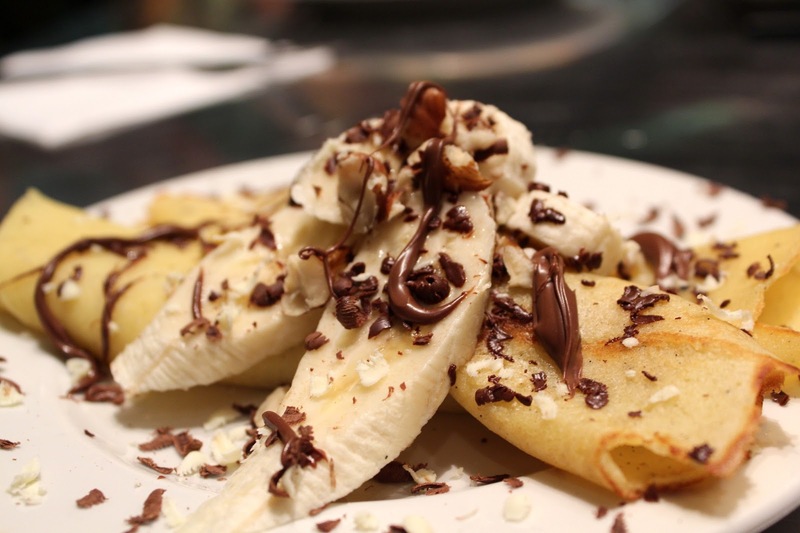 Bananas, white and dark chocolate, hazelnuts, Nutella (no not sponsored by them) and brown sugar. 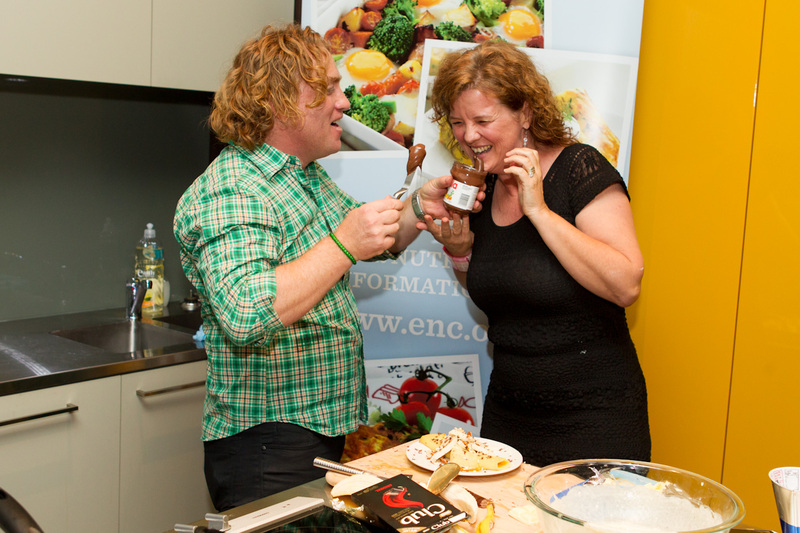 The sexual tension rose as we mucked around with the Nutella. No just kidding, I was just wondering if you were still reading.......Actually I had trouble drizzling the Nutella, so Adrian decided to help .........not. Clearly the Nutella incident distracted me, because I lost the cook off to this piece of gorgeousness by Lisa. A raspberry, blueberry and chocolate pancake pizza. If you crack an egg on a flat surface, rather than on the side of a bowl, you are less likely to get shell in your mixture. Raspberries, blueberries and chocolate are a better combo than bananas, hazelnuts and chocolate, hands down. I'm not as good a cook as I thought I was. I like being schoomzed by celebrity chefs. Who wouldn't? 1. Whisk egg whites to firm peaks. 2. Mix flour, egg yolks, sugar and milk together in a bowl until smooth (no lumps). 4. Allow to batter to stand for 10 to 15 minutes. 5. Add the blueberries to the batter. 6. Place a knob of butter in a pan, on a low to medium heat. 7. Ladle the mixture into the pan, to cover the base of the pan. 8. Cook the pancakes until golden brown on one side then flip over and cook until golden brown. 1. Mix flour, egg and water together in a bowl until smooth (no lumps). 2. Allow the batter to rest for 5 to 10 minutes. 3. Ladle the mixture into the pan, making a 20cm pancake. 1. In a frying pan, cook prawns in butter and salt and pepper to taste. Set aside to cool. 2. In a bowl, add coriander, spring onions, chilli, cucumber, mint and sesame seeds. Toss with hands. 1. In a bowl, add lime juice, fish sauce, palm sugar, peanuts, ginger and garlic. Mix together. 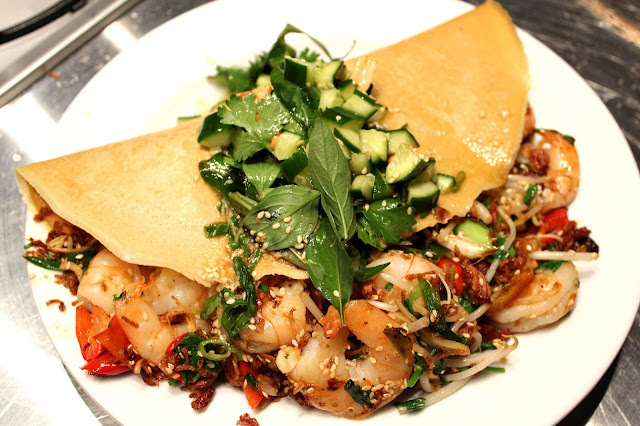 Place a little of the prawn salad in the centre of each pancake & fold over. Drizzle a little dressing over the pancake and serve hot. I was invited to attend this event by Easy As Eggs but was not paid to write this post. I had alot of fun and think this blogging game sure is an interesting one!!!!!!!!! The cruise is up next. This is a great post. I learned things. 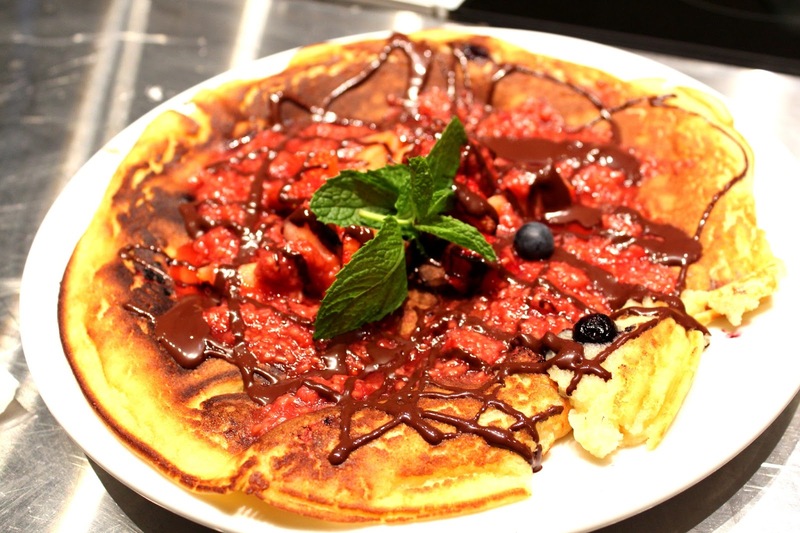 You can make a pizza from a pancake?! beautiful recipes! looks like you had a fun day. he seems a nice guy.. i really liked the TV show good chef bad chef. Oh my godness your famous! Looks like you had a fantastic time and that food looks good enough to eat! Yum!! I have to say I think yours looked and sounded much more appealing - I think you were robbed! Must say that both your and Lisa's pancakes look fantastic and I'd have scoffed them both at once! I'd have soloved to go to this event, and then to have had a good old wander around that part of time, and especially around that cheese room. <aybe we can go and have a nosey and a coffee there ourselves one fine day. I just wanted to say THANK YOU!!!!! All these pictures put 10lbs on my hips, just looking at them!!!! you couldn't stop laughing. And it's always nice to have days like that!! Oh yum!!! I am hungry now. Awesome photos. Looks like great fun Carolyn! I'm pinning those prawn pancakes for those Lenten Fridays when I won't be eating meat (cough!). The pics of the cruise on instagram looked gorgeous, hope you had a ball. Lucky You! And us- because you blogged about it! 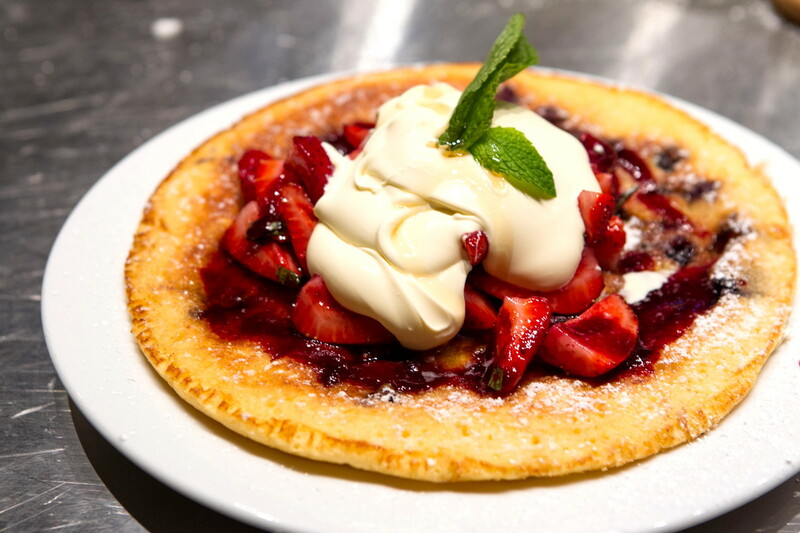 Oh that thai style pancake looks absolutely yum! How much fun was THAT?! Thanks for sharing with The Clever Chicks Blog Hop this week! I hope you'll be back with another adventure!